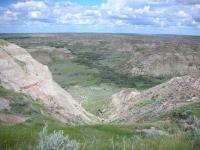 Dinosaur Provincial Park is renowned for its beautiful “badlands” and high number and quality of dinosaur fossils. 75 million years ago, rivers that flowed here deposited sand and mud. 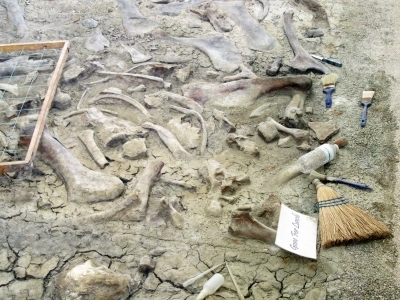 The conditions of the resulting landscape were excellent for the preservation of dinosaurs' bones as fossils. The first dinosaur skeletons were recovered here in the 1880s. Over 40 dinosaur species have been found and more than 150 complete dinosaur skeletons, making it one of the richest dinosaur fossil locales in the world. The specimens represent every known group of Cretaceous dinosaurs. The park is situated in the valley of the Red Deer River in Alberta, Canada. It covers three distinct habitats: riverine, badlands and prairie. This was the first site that I visited on my Canada trip. I had arrived the day before in Calgary, and got up early to make the 2.5 hour drive eastwards to see this park. Due to the 8 hour time difference with Europe I was awake in the middle of the night anyway. The drive is easy (one stretch of highway for 90% of the ride) and my Garmin had no trouble finding the park entrance. It’s not signposted from the main highway so you have to know where to get off, but after that there are signs all the way. Right before the entrance lies a viewpoint that possibly is the best of the whole park. It lets you look down into the canyon. The different layers of sediments in the ‘hills’ stand out clearly. Great views! I had pre-booked a tour for 9.30 called the ‘Centrosaurus Quarry Hike’. This 2-2.5 hour hike is supposed to get you into the reserved zone and among the dinosaur fossil beds. At the reception however I was told that the tour could not run this day: overnight rain had made the trails too slippery. They were offering an alternate tour through the public zone. Some 20 other visitors including a number of children showed up to take that tour with me. We were transported in a bus to the other end of the park, and dropped there for some sedate walking. I wouldn’t call it a ‘hike’ as it required no energy at all. I also didn’t like the way the tour was conducted: a kind of American-style Q&A at the intellectual level of an 8-year old child. The best part came at the end: we were allowed into a small part of the reserved zone to look for dinosaur fossils. Just to look at them of course, not to dig them out. And this area literally is covered with them: tiny bone splinters, teeth and some more intact bone structures. Little excavation is done here nowadays, they have enough already and are looking for the more interesting stuff such as dinosaur eggs. Of the Canadian fossil sites I have visited, I enjoyed Dinosaur Provincial Park the most. A great part of this is due to the size of the fossils on display in the on-site museum, to include tyrannosaurs, hadrosaurs, and ankylosaurs, all unearthed in the surrounding fluvial landscape. I spent an August day with dinosaurs last summer, starting off in the museum, and then exploring the nature trails in the surrounding badlands to see exhibits detailing former archaeological sites. I love the Badlands of South Dakota, and it was impressive to see a similar landscape inscribed as a World Heritage Site, even if primarily for the fossils found there (and I still find the US Badlands as separately unique for their own prairie and Native American heritage). Returning to the visitor center, I took part in a program to create plaster casts of fossils, which was enormously entertaining, and provided some unique gifts to pass on to my nephews and nieces. I wish I had had time to visit the excellent fossils at the Royal Tyrrell Musem of Paleontology a couple of hours away in Drumheller, but with time running short, I had to continue on with my travels to Lethbridge, Alberta, where I closed out my dinosaur day with a viewing of Jurassic World: Fallen Kingdom. It only seemed fitting. 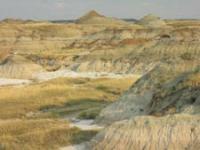 Logistics: Dinosaur Provincial Park is about three hours east of Calgary, Alberta, and is best reached by private transportation. We had pre-booked the Sunset tour knowing we would arrive in the afternoon (after 3 p.m.). The tour starts at 7 p.m. so we had time to do something on our own. We began with the rather well-organized and informative visitor center and continued with the 3.2 km loop drive with short hikes seeing some of the badlands up close and some fossils, all in the non-reserved zone. After q quick bite at the café at the parking lot we were ready for the Sunset tour. It was a really hot afternoon (between 30 and 40 degrees) so the 10 to 15 people group were recommended to bring a water bottle each and something to cover your head. 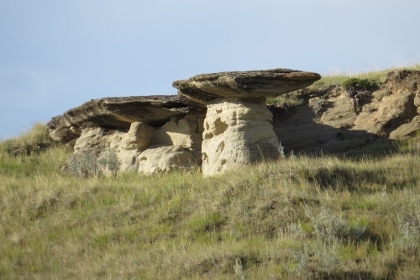 On the bus, into the reserved zone, off the buss – and then we were walking between dinosaur fossil bones and teeth – amongst typically local hoodoos. Fantastic! We could pick up fossils and ask the guide for information about the items, but we had to put it back again. The badlands is probably much the same everywhere it exists, but as we’re not too used to badlands – this one was very scenic even from “the bottom”. The setting sun made profiles and shadows changing and it made then “dead badland” more alive. An almost complete fossil skeleton was covered and locked – until the guide opened it to us. Really magnificent! At the end of the two hour we drove to the nearest town to spend the night. The motel and town Brooks didn’t have much to offer, but it was sufficient for us as we headed on the next morning. Great breakfast though. Very immense and incredible, even if you're not into fossils. If you're not into evolution and the whole "millions of years" theories, don't let that detain you. If you are in Alberta Canada, it is definitely worth the visit. This site is incredible. there are hardly words to describe it. A Canyon of Badlands and hoodoos; i think is the best description. the hoodoos are rock formations, of of unusual and wonderful shapes. when we drove into the park, the first turnoff lead us to a breathtaking viewpoint; over a large canyon/valley, filled with badlands. there was a surprising amount of plant life; i had expected the badlands to be barren, but there were trees, grass, bushes a plenty. a trail led from the top, all the way to the bottom, it was quite steep, and in some places narrow and scary. but is was a great trail. we got about half way down, before turning around, and climbing back up. there are two sections to the park, the reserve, and the non-reserve. the reserve covers 70% of the park, and is only accessible by guided tour, there are several hiking trails in the rest of the park, that you can hike by yourself. we took a tour, and the guide led us to a part of the park, which was a dry lake bed. Bones littered the ground. 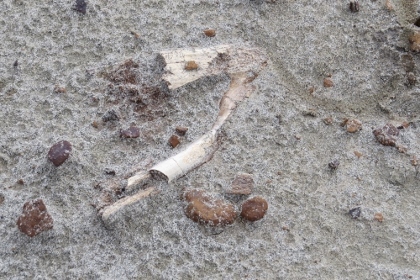 everywhere you look, there were dinosaur bones on the ground. not big ones, most were smaller then your fist, but they were everywhere. it was remarkable! after the tour, we hiked on a trail, that took us, through badlands, to an overlook over a wide valley, with a river at the bottom. it was an amazing trip. this is in my opinion, the best thing to see in all of Alberta. The badlands do truly come out of nowhere while you are driving through the prairie, which seemed neverending but beautiful. Upon entering the park, my husband and I were welcomed by the sight of the province of Alberta's flag, the Canadian flag, and the UN flag waving side by side. This not only marks the entrance but the location of the World Heritage site plaque as well. As of 16 June 2006, the road to the plaque's location was under construction, so we walked to the plaque. I highly recommend you do this, as the most stunning view of the badlands is here! I encourage you to take the bus tour around the park, which includes a drive to the natural preserve. 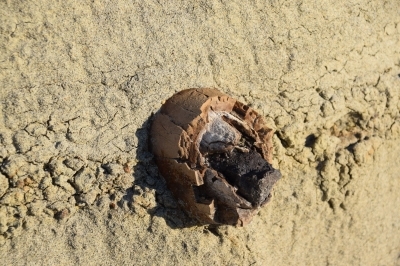 Three-fourths of the park is in the preserve, where the dinosaur fossils have been found in the past and where some can still be found. There were mushroom-shaped rocks called "hoodoos" throughout the preserve and some took on very interesting formations, like a pyramid and camel (as if you had your piece of Egypt within the preserve)! 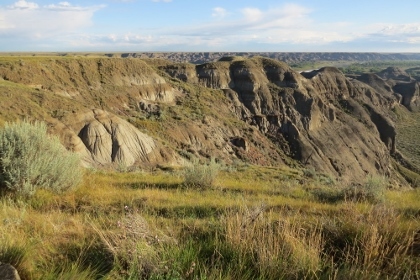 Even if dinosaurs aren't your thing, I'm sure you will find Dinosaur Provincial Park interesting. A fact about the park is that it is home to 3 distinctive habitats: prairie, badlands, and riverside forest. There are many chances for spotting wildlife as well. I had seen pictures of the park before, and I really tried visiting the site. Lots of people only visit the town of Drumheller for it's well done Dinosaur museum and the badlands surrounding it, but Dinosaur Provincial Park is much more impressive. When you drive up to the place the only thing you see is plains, but then suddenly, when you look below, you see these badlands! When the sun is shining the brown rocks turn orange, it's a beautiful place! You might see some deer and rabbits too. Unfortunately, only a small piece of the park is open for visitors; the rest of the park is only open to researchers with a special permit. For them this is a great place since it has the most Dinosaur Fossils in the world. Dinosaur fossils are dug up by scientists and their students during the summer months then transported to the Tyrell Museum (not included in the World Heritage Site), in Drumheller, to be studied and reconstructed.The Feild Station in the park is undergoing major renovations and will be open spring 2006. There are great, inexpensive camping facilites in the park. 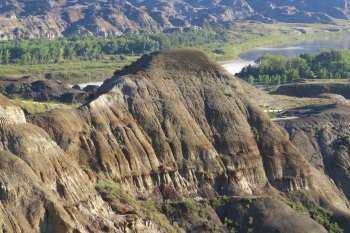 Staying a few days gives you time to explore the 3 main areas of the park:the ancient cottonwoods along the Red Deer River,the lookouts over the valley from the prairies and the actual Badlands. The guided tours with the rangers are highly recommended when you first arrive. Then when you go exploring the many trails by yourself you have some idea of what you are looking at. While visiting my uncle in Alberta, my family took a trip to Dinosaur Provincial Park. We had an amazing time exploring the trails and visiting the exhibits. I would definitely recommend this place to anyone with an interest in paleontology. The park entrance lies near the town of Patricia, some 2.5 hours drive east of Calgary on Highway 1 (although it's not signposted from the highway, so take a map or GPS). The park website has driving instructions, which make it look more difficult to find then it actually is. There's no public transport.